Welcome to Digital Digest! It is a slow news week, but we've got all of your regular features, along with a review of Mighty Morphin Power Rangers - Season 2, Volume 1. Let's get started! News for new DVD releases has been slow for sitcom fans this week, but for cartoon fans, not all is lost. First up is Tom and Jerry. This week, Warner Home Video announced a pair of new releases for the classic cat and mouse series, heading to DVD on June 11. Tom and Jerry in Space and Tom and Jerry - Magical Adventures. Second, for fans of Peanuts, Warner Home Video has 4 Kid Favorites: Happiness is Peanuts on March 4, which will contain four of five previously released Peanuts titles. Fans of Night Court should know by now that Warner Archive has been pretty consistent in trying to complete the series, but there is still one season to be released. While we don't have any definitive information on any dates, Warner Archive has indicated that it is already in the works (and anytime that they say that, we're usually only weeks away from a release). We'll let you know once we know anything new on this! This week, there is good news for our fans north of the border, as Netflix recently added the entire run of the series The Facts of Life... but to be clear, this new offering is only available in Canada. However, there is no indication that this series will be available anytime in the near future (if at all) on Netflix in the United States, but if this changes, we'll let you know! Tuesday (April 16) is the first of a two week "dry spell" for sitcom releases, but Tuesday does include the release of In the Heat of the Night - The Complete Eighth Season. For those who are curious, full season releases of seasons two through seven have not yet been released. Again, it's Morphin Time! Following its debut in 1993 (hence why the MSRP is $19.93! ), Saban's iconic live-action pop culture series, Power Rangers quickly became the most watched children's television program in North America and Shout! Factory is releasing each season in two volumes each on DVD. We are now into season two and we have the first 26 episodes from that season. Unfortunately we never received the second volume for season one, so any comparisons we make will be from the first volume of season one. Mighty Morphin Power Rangers: Season Two, Volume Two 3-DVD set is slated to arrive on store shelves on May 28, 2013. Featuring the subsequent 26 original episodes of the 52-episode second season, this DVD set continues more action-packed adventures of these five teens! And if that's not all, season three is slated to release on July 2, 2013 and that won't be released in two volumes, since the episode count was much less in season three. Starring Austin St. John as Jason the Red Ranger, Walter Emanuel Jones as Zack the Black Ranger, Amy Jo Johnson as Kimberly the Pink Ranger, Thuy Trang as Trini the Yellow Ranger, David Yost as Billy the Blue Ranger and Jason David Frank as Tommy the Green Ranger. Midway through the second season, Rocky DeSantos (Cardenas), Aisha Campbell (Ashley), and Adam Park (Bosch) join the cast replacing Austin St. John, Walter Emanuel Jones and Thuy Trang. We'll have more on that in volume two. Among the most memorable episodes from the first half of the second season include the three-part premiere, "The Mutiny," where a motor bike rally is interrupted by news of a incoming threat, while angered by Rita's failure to destroy the Rangers, Lord Zedd arrives to accomplish what she could not: destroy the Power Rangers and banishes her to deep space as punishment, as the Rangers find their Dinozords are no match for the powerful new enemy as his first monster Pirantishead freezes them solid. In "The Bloom of Doom," Lord Zedd puts a spell on Kimberly turning her against best friend Trini and he then sends the Bloom of Doom to uproot the Power Rangers. In "The Song of Guitardo," as Kimberly tries her hand at song-writing, Zedd decides to create a rock-and-roll nightmare and he calls forth Guitardo, a super cicada with a hypnotic sound. In the two-part episode "Green No More," after receiving news that Tommy's next battle will be his last for the Green Ranger, Lord Zedd creates Turbanshell to rid himself of the sixth ranger once an for all. In "Beauty and the Beast," when Kimberly goes to a fortune teller to help her with her Tommy woes she is kidnapped by Goldar with the intention to make her into Zedd's new queen. In another two-part episode, "White Light," Kimberly announces exciting news...Tommy's coming back and the Rangers are happy, but their joy is cut short when Lord Zedd creates the Scarlet Sentinel which overpowers them and to make matters worse, Zordon and Alpha 5 disappear without a word! And finally, in the three-part episode "The Ninja Encounter," the kids enjoy a day at the park and make some new friends: Rocky, Aisha, and Adam. And, everyone's excited about the upcoming ninja competition at Angel Grove High School, but Zedd has plans of his own for the ninja competitors. Packaging is a snap case holding the discs inside, similar to the previous releases. 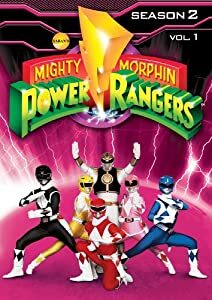 The cover art of this first volume has all of the Power Rangers (Black, Yellow, Red, Pink, Blue and...White) with the Mighty Morphin Power Rangers logo above them. The color scheme is pink. The back of the case has a synopsis of the show, the set, and technical information. We also have a shot of Lord Zedd and another one of the White & Pink Rangers. Inside the case, there is a disc-by-disc breakdown on the left panel, listing every episode on this set. We just get episode titles, though. The discs don't overlap each other, which is great. We have a plastic holder in the middle. Discs one and two are on that plastic holder, while disc three is on the right panel. Artwork on the discs is in that pink color scheme, with the Mighty Morphin Power Rangers logo and whatever disc number it is on the disc. This is all similar to previous releases. The disc-by-disc breakdown is available in the above section in episode runtimes, but basically we have about 8-9 episodes on each disc. That might be a lot per disc, but I feel they should have released all 52 second season episodes on one set on a six-disc set, since they are cramming about 9 episodes on each disc. As for the menus, the main menu is very cool and similarly designed to the season one sets. We have the addicting theme song playing in the background, and we have the logo then we enter the Command Center! Instead of where we see Zordon, we have clips playing in the background! Very cool! The main menu options are: Play All and Select Episode. No subtitles, but the DVD is closed-captioned. When we select the Select Episode option, we have a cool transition into that submenu with the alarm sound for the command center playing in the background. The episode number and titles are listed inside that option. Pretty easy to navigate and nicely designed, I think. It's basic but cool. The video quality is decent and on par with the first season sets. It's not great, but not terrible either. It is certainly better than VHS and any episode you might have recorded originally on Fox Kids or in reruns. The audio quality is also good, that is crisp and clear. No problems here at all once again. The series had to be pretty cheap to produce as it looks very cheap, but hey, everyone loved watching it! There are once again 6 chapter stops for every episode, counting the opening and closing credits stops. All of the multiple part episodes have the "To Be Continued" line at the end of each episode, but we don't have any of those "Previously on Power Rangers" recap at the start of the next episode, just like we don't have the "Today on Power Rangers" preview on every other episode. I always liked those, so I'm disappointed. Also of note, this first half of season two has three different opening themes...the first 2 episodes have the same one as season one. But from the third episode to after "White Light" 2-part episode we have a big change. And after that "White Light" 2-part episode, we get another theme, with a little change made. We have zero special features once again. The complete seasons 1-3 release has special features from Time Life. I hope we get them eventually on the individual releases that Shout! releases, too. But so far, we haven't gotten any from Shout! On the complete set, as mentioned before, we get new interviews with the cast, casting director, fans, plus all the direct to video specials that were released. I don't think the original pilot episodes is included, which is a shame. In 1999, Fox Kids aired an original unaired pilot episode hosted by Austin St. John (Jason the Red Ranger) and Walter Emanuel Jones (Zack the Black Ranger). It is on YouTube even, as we mentioned last time. This pilot had a different yellow ranger and some other plot changes. We also had another unaired pilot episode but it has never been seen, so that would have been nice, too. It's great Shout! is releasing these seasons quickly. The second season was very cool with a lot of changes and can't wait to see the second half soon, which will have even more changes. I think I like the second season episodes the best, especially this first half. I highly do recommend any fan of the show to pick-up this set, because the episodes are so good and addictive. It's cheesy fun. If you've never watched it, then please do try it, especially if you watch the new series. The only thing missing are the previews before each episode, but that's not a big deal. Everything else is pretty well done on this set. My only other gripe again was no bonus features, but that is probably exclusive for the complete series set from Time Life. I hope we do get those on a regular season volume later on. Anyway, it's Morphin Time with some changes...and no need for us to go to the Command Center and buy this DVD because we have a link below for you to order. Hurry before Lord Zedd chokes you so hard that you'll go from green to white! Who to Follow: Candace Cameron Bure (Twitter), "Loves Jesus, being a wife & mommy, philanthropy & doing that acting thing." Claim to Fame: Most of us remember her before she was Bure, when a young Candace Cameron was introduced to Americans as the brother of Kirk Cameron. By 1985, Kirk Cameron had become a well-known household name with the debut of Growing Pains, and two years later, Candace Cameron began her role of DJ Tanner on Full House. Since that series was canceled, she has had plenty of guest roles and made-for-TV movie appearances, including an upcoming Hallmark Channel movie that she is filming with Alan Thicke (who, of course, played her brother's father on Growing Pains). Why You Should Follow Her: Candace Cameron Bure is one of those Twitter busybodies who is always Tweeting about anything and everything. She maintains a busy life as she continues to act, is a wife, is a mother to three children, and even is a partner (along with her husband) in a California winery called Bure Family Wines. Outside of all of this, she still finds plenty of time to Tweet about everything from her past career and present life, and seems to enjoy it all along the way.